Logistics has been around since the wheel was invented, and some of our customers have worked with Vinayak Bulk Movers the whole time – well almost. At Vinayak Bulk Movers, we think we’re the best at what we do, and we work hard to stay that way! We are transporting specially for Dry and Liquid products by our Trucks and Tanker Lorries with insolated and none insolated with our group of 70 vehicles for mostly from Kandla / Gandhidham to various places in all over India. Shipping liquid bulk is a unique process. We know that when shipping liquid bulk materials it is critical to get the product there safely, on time, and at a competitive price. It’s unusual for one logistics company to provide a solution that lives up to all three requirements - but Bulk Connection does! Since 1987 we have helped thousands and thousands of buyers and shippers deliver their materials to the right place at the right price. Today we handle more than 2,000 loads per month! Whether it’s inbound raw materials or final product, we know how to properly handle materials like chemicals, pulp and paper products, paint and solvents, and lots more. Reliable service throughout the INDIA. All quotes are for flat rates and include all charges. We can provide you dedicated transportation services as per your schedule. Confidential handling of your third-party / bulk transportation. Prompt rate quotes and "last minute" emergency service. Because Vinayak Bulk specializes in handling dry bulk commodities we have tons of experience to make sure that you get the best results – service and prices. 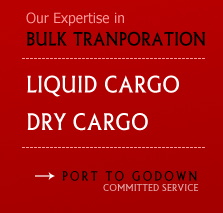 For more than 10 years we have provided services to Food grade Industries, and most other dry bulk products. We know this business like no one else so we make sure we utilize the proper equipment to ensure the integrity of your cargo anywhere in the India.